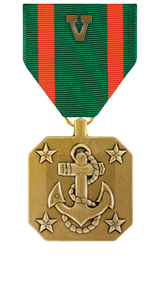 Heroic achievement in the superior performance of his duties while serving as Corpsman, 1st Squad, 3d Platoon, Company L, 3d Battalion, 3d Marines, Regimental Combat Team-7, I Marine Expeditionary Force, from March to September 2006, in support of Operation IRAQI FREEDOM. While conducting combat operations, Hospitalman Ancheta exemplified the true meaning of courage as he fearlessly exposed himself to a known enemy sniper position to move a wounded Marine to safety. His exceptional performance combined with his superb technical ability to treat a serious injury, helped keep a Marine alive and prevented more serious injury to the casualty. His willingness to put personal safety aside for the life of a fellow Marine was the epitome of self sacrifice. He proved to be a valuable asset not only to his platoon, but to the entire company. Hospitalsman Ancheta’s initiative, perseverance, and total dedication to duty reflected credit upon him and were in keeping with the highest traditions of the Marine Corps and the United States Naval Service.